Now it was time to get to grips with the Asus Vento 3600 for real. We fished out a test motherboard and some drives and got to work installing the components into the ASUS case. The side panel ships secured by a single screw which needs to be removed before you can use the side swivel handle to open the case. Once this was removed, turning the handle clockwise unlatches the side panel, allowing it to be pulled away. The swivel handle operates very smoothly and neatly, and adds immeasurably to the whole space-age feel of the case. The spacious interior allows plenty of room for all ATX motherboards. Thanks to the extra height of the case, the top two 5.25 inch external drive bays are above the plane of the motherboard, so even if you have a full size board, you can mount at least two CD drives without worrying about them interfering with the board. The backplane of the case sports built-in risers for most ATX motherboards, though additional risers are included if your board needs more or different connections. Installing the motherboard was straightforward as we'd expected. One thing we noticed and appreciated at this point was the way that ASUS had rounded most of the steel edges inside the case. Having worked in computer stores, I appreciate any attempt to protect our tender hands from the pain of sharp steel 'case cuts'. The expansion slot covers are secured by green plastic locking tabs which need to be levered open and removed from the case. 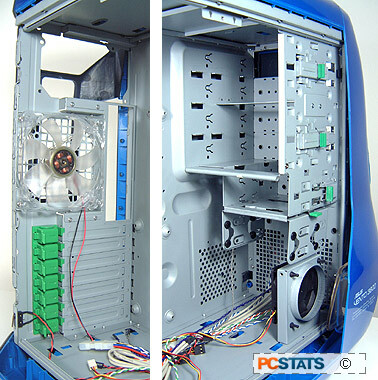 The metal covers can then be easily removed and PCI, AGP or PCI Express cards installed. The tabs can then be returned to their places, locking the expansion cards in place.